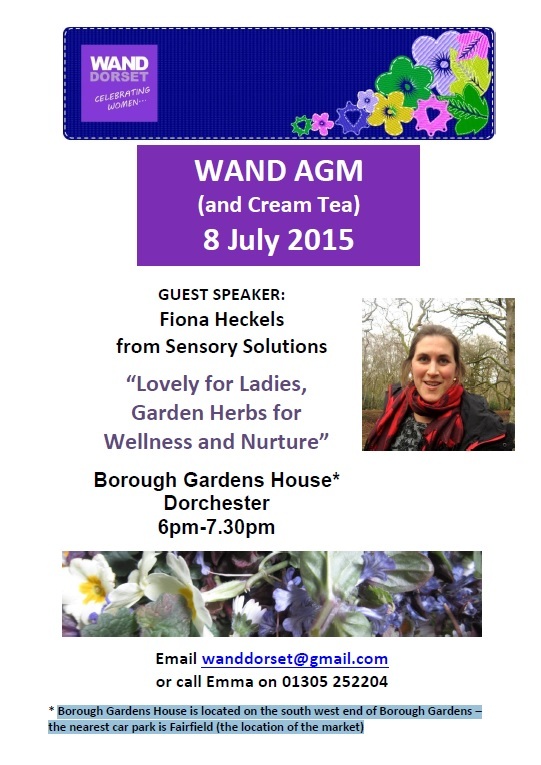 WAND invites you to our AGM for 2015 which is being held on Wednesday 8 July from 6pm at the Borough Gardens House in Dorchester. 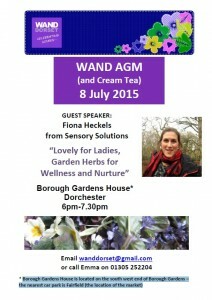 As well as the usual AGM business and a delicious cream tea, we are excited to welcome Fiona Heckels who will be giving a talk (and demo) entitled “Lovely for Ladies, Garden Herbs for Wellness and Nurture”. Fiona is a local herbalist with many years experience and training who runs a business with her friend Karen called Sensory Solutions. Fiona believes that our local environment contains all we need for a medicinal cabinet and this talk will introduce you to local herbs and plants that you can use to improve your health and well being. Please email wanddorset@gmail.com or phone Emma on 01305 252204 if you have any queries. The Borough Gardens are located on the south west end of Borough Gardens – the nearest car park is Fairfield (the location of the market). View a printable version of the poster here. This entry was posted in Event and tagged AGM, Dorchester, news, women on June 9, 2015 by mariac.